Place puff pastry sheets on a lightly floured work surface to thaw out. In a small saucepan over medium-low heat, pour milk to warm it up – don’t boil it. In another saucepan, whisk together egg yolks and sugar. Add flour and whisk to blend. Pour warm milk a little at a time to egg mixture (temper the eggs), whisking constantly. Turn heat to medium and cook until custard thickens, whisking continuously. Remove from the heat to cool off. About 5 minutes later, add vanilla, whisk again before transferring pastry cream into a bowl. Place plastic wrap, making sure it touches the surface to preven skin from forming. Cool completely before transfer to the fridge until needed. Preheat oven to 400ºF. When pastry is thawed out, roll it out to 9 x 14”. Line a 10 x 15” baking sheet with silicone mat or parchment paper. Put dough onto baking sheet and prick the entire surface of with a fork. Brush with milk and sprinkle with sugar. Place parchment paper on dough and put another baking sheet of the same size over; bake for 15 minutes. Remove from heat, carefully take baking sheet and parchment off and flip dough over. Place back parchment and baking sheet on top and bake for another 8 minutes; let cool. Meanwhile make icing by combining confectioners’ sugar and milk. Stir until smooth with a thick consistency. When pastry is at room temperature, cut 1 sheet lengthwise into 3 equal size pieces; do the same crosswise. If rectangles are not perfectly shaped, trim to make them even. Each mille-feuille should have 3 rectangle pieces. To assemble, spoon cold pastry cream on 6 bottom rectangles; spread custard evenly. Place the second layer of rectangles on top and add pastry cream; spread evenly. Place the top rectangles and cover with icing. Spoon melted chocolate into a plastic bag. Cut the corner of bag and draw straights lines on the icing. Slide the back of a knife in the opposite direction to form a marbled pattern. 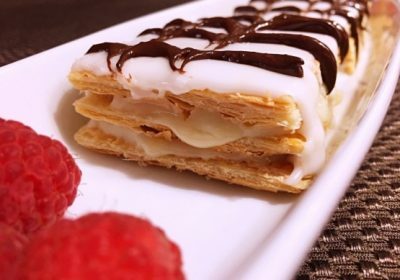 Serve milled-feuille chilled and keep the rest in the refrigerator. Makes 6 pastries.